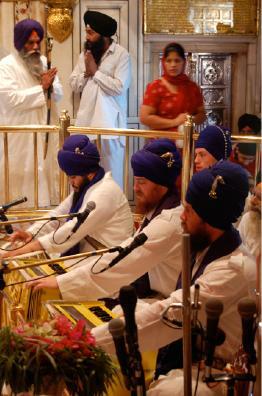 The Chardi Kalaa Jatha is a group of young American Sikhs. Students of the late Siri Singh Sahib Bhai Sahib Harbhajan Singh Khalsa Yogi Ji, the Jatha trained for many years under their ‘Ustaad ji’ Narinder Singh Sandhu. 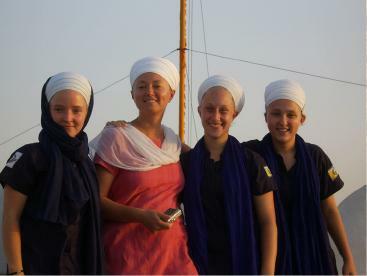 Each is a graduate and now a teacher at Miri Piri Academy in Amritsar, India, and Jugat Guru Singh Khalsa, one of the Jatha members, is the Principal and Director of Spiritual Education. The Jatha has had the privilege of singing Gurbani Kirtan in the Siri Harimandir Sahib for several years, and they have travelled extensively, sharing, teaching, and inspiring Sangats around the world. Chardi Kalaa Jatha is travelling to Melbourne to participate in the W orld Parliament of Religions and to meet with the Melbourne Sangat. Miri Piri Academy is an international boarding school in Amritsar, India. Based on Sikh values and lifestyle, the Miri Piri Academy program combines Cambridge accredited academics with training in Kundalini Yoga and an emphasis on spiritual practice. Miri Piri Academy accepts students from third through eleventh grade. I went to the CHARDI KALAA JATHA website and the youtube doesn’t work and the contact email doesn’t work so there is no way to contact these people and tell them anything? i m thankful to u for updating but what i need to know no one tells .well i m a turbaned sikh international ghazal & old melodies singer like to marry an american sikh ( caucasian ) turbaned sikh lady so please mail me the required informational site address ; thanks.